Earlier this week, we visited the New York School of Interior Design‘s latest exhibit, Rescued, Restored, Reimagined: New York’s Landmark Interiors, which, on the 50th anniversary of New York’s landmark legislation, features photography and information about more than 20 public spaces, known and little-known, that have been designated as interior landmarks. Looking through images of restored Broadway theaters, perfectly preserved coffered rotundas and period furniture, we couldn’t help getting stuck on one often-overlooked element–the elevator. For most of us who live in a high rise or work in a typical office building, the elevator doors are just another blank wall that we stare at, only paying attention when they open and usher us in. But when the city’s great Art Deco buildings were rising, the elevators were an extension of the lavish ornamentation and geometric details of the façade and interior lobby. 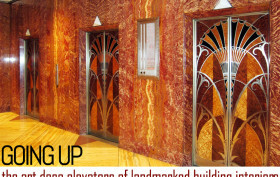 We’ve rounded up some of our favorite Art Deco elevators in landmarked interiors, which means they’re all publicly accessible so you can check them all out first hand. The Rainbow Room served its first guests on October 3, 1934, and now, almost 80 years later to the day, the historic restaurant and event space has reopened after a restoration by Gabellini Sheppard Architects. Located on the 65th floor of the Raymond Hood-designed 30 Rockefeller Plaza (30 Rock), it was the first restaurant located in a high-rise building and for decades was the highest restaurant in the country. Suffering from a decline in business, the fine-dining establishment closed its doors in 2009. 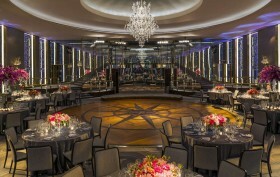 But in 2012, the Rainbow Room was declared an official interior landmark by the Landmarks Preservation Commission (LPC), and a year later it was announced that the storied space would reopen this fall. Right on schedule, the new incarnation of the venue opened last night for a preview by the Sir John Soanes Museum Foundation.